Sooner or later, every cop must prove himself on the gun range and Detective Prick Peckard, head of The Robot Crimes Division is no different. 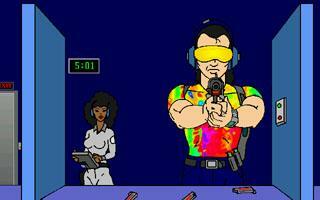 Guide Prick's aim as he negotiates the gun range under the watchful eye of Range Master Debbie Sauer in this astoundingly crude first person shooter! Barn Runner: Don't Jerk The Trigger of Love is the third game in the Barn Runner series and the first to showcase an early build of the code that will provide the under-powered action sequences for the upcoming Barn Runner: The Forever Friday. Follow Debbie's instructions as she tells you how to complete each range (there are three in all) with a winning score. Of course, since this is a retro-game (and I'm not John Carmack) this shooter is more in the mode of Duck Hunt than Doom 3. I hope you enjoy my little game. This game is super short. Really Short. Basically a test out for stuff to come up in the next few Barn Runner series. Basically you have 3 shooting ranges, each getting more difficult. 3 rounds a magazine, which proves no room for mistake. It takes a few minutes to get used to the shooting, but by the time you get used to it, the minigame is over. Can't wait for Cop Who Copped a Feel!